We have all heard of the Dollar shave club and another one named after a guy named Harry. They are advertised by big name talk hosts and are heavily marketed. You can even buy them chain stores now. I'm a member of the Nickel Shave Club. I started shaving back in the 60s. You remember (or maybe you don't) the good ol' days. The two major brands back in those days was Gillette and Schick. I remember Gillette had the two edge (not two blades) razor and Shick had the single edge "injection" blade. The Shick had this cool packagin where you inserted a probe into the razor and slid a slide and the new blade was inserted and the old one fell out. Back in those days, all of the medicine cabinets had little slots on the inside where you could dispose of used blades. I guess the old blades fell down inside the wall between the 2x4 studs. No pun intended for your male shavers. I guess someday archeologists of the future will have to figure out how those clumps of blade slivers were useful for society and what purpose they were used for. I preferred the Gillette. It had a know built into the end of the handle that opened the top of the razor clam shell sytle. That's where the blade went. After removing and disposing of the old blade (in the medicine cabinet slot for future archeologists) you slid the new one in and then closed the clamshell. The fancy razors were black and chrome. There was alos a little collar just below the head that was numbered from 1 to 10. That was supposed to adjust the closeness. But what "stud" in his right mind would ever choose less than a 10! Now that I have been shaving for over 50 years, I have seen lots of razors go by the wayside. After that Gillette double edge stopped being fashionable, the twin blades were in vogue. My favorite was the Gillette Microtrak. It was pretty good. It had a small shaving head and the blades went close to the side so you get to all of those tricky areas. Alas, the Microtrak is now obsolete. It gave way to the new multi multi blade shaving rigs. The new ones went rapidly through 2, 3 and 4+ blades. I spent a fancy amount of lunch money on one of the six bladers and couldn't figure out how to get it positioned so I could get a clean shave without skinning myself bloody. I felt like a teenager getting ready for a date again. Have you looked at the blade replacement cost for those things. The grocery store now has to put them in locked displays so desperate shavers won't be tempted to pocket them without paying! Enter the Nickel Shave Club: no membership, no dues, no rules - Get what you want, when you want. For the best quality, get an Edwin Jagger razor with Derby double edged (double sided) blades. Once you have the razor, the blades cost about a penny apiece ($5 for 50). The blades last about a week. 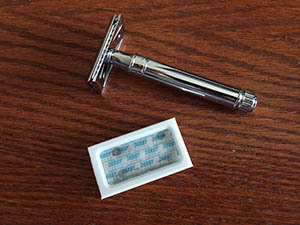 You can change the blades daily for about a nickel a week or once a week for a nickel a month - The Nickel Shave Club. If you want to join, just go to the online big box store that starts with an A.